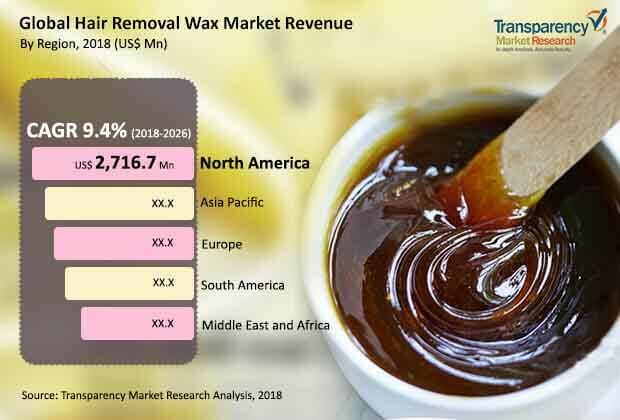 According to a new market report published by Transparency Market Research titled ‘Hair Removal Wax Market – Global Industry Analysis, Size, Share, Growth, Trends, and Forecast, 2018 – 2026,’ the global hair removal wax market is expected to reach a value of US$ 18,814.3 Mn by 2026. The market is estimated to expand at a CAGR of 9.4% during the forecast period from 2018 to 2026. In terms of volume, the market is expected to reach over 5,000 million units at a CAGR of approximately 8.0% in 2026.The hair removal wax market in Asia Pacific is projected to expand at a rapid pace during the forecast period. According to the report, the global hair removal market is experiencing high-paced expansion in its size and valuation, owing to increase in beauty consciousness among consumers across the world. The need to maintain a well-groomed physical appearance is one of the major factors responsible for the expansion of the market. Waxing offers clean and clear skin for a longer duration as compared to the other alternatives. It can be easily carried out on any area of the body, including eyebrows, face, bikini area, legs, arms, back, abdomen, and feet. The demand for hair removal solutions is much higher in beauty salons & spas and is anticipated to continue rising over the next few years. Moreover, rise in popularity of at-home hair removal wax techniques with the usage of wax strips among the younger and adult generations is likely to boost the hair removal wax market. Furthermore, more men are seeking waxing services as tailored grooming becomes mainstream, and women of all ages are looking for alternatives to shaving to achieve smooth skin. This is expected to propel the market. The hair removal wax market can be segmented based on type, application, end-user, and distribution channel. Based on type, the market can be categorized into soft wax and hard wax. The soft wax segment accounted for a prominent market share in 2017, owing to the ability of soft wax to adhere to skin more than hard wax and exfoliating skin. Soft wax is able to hold fine hair perfectly and works better on large parts of the body. Soft wax is generally cheaper than hard wax and less painful for most people, and businesses are making more money using it. In terms of application, the commercial segment is expected to expand at a CAGR of over 9.0% to reach over US$ 14,000 Mn in the near future. The segment is expected to be followed by the individual segment. More and more consumers prefer to visit beauty salons or spas for waxing as they are less messy and provide specific procedures of waxing, such as bikini wax, Brazilian wax, and Hollywood wax. There are even waxing procedures available that cater specifically to men. In terms of end-user, the market is largely dominated by the women segment, which is expected to expand at a faster pace owing to the changing beauty trends among women and increasing consumer awareness about personal grooming. While more than 90% of today's wax users are women, the number of men waxing their chests, backs, ears, nose, and other areas is also increasing steadily. Based on distribution channel, the market is currently dominated by the offline channel. However, in the near future, online sales are anticipated to rise at a fast pace owing to technological advancements and preference of brands for selling products online as it makes it easier for them to penetrate different markets. In terms of geography, North America dominated the global hair removal wax market in 2017 with more than 25% market share and is expected to maintain its leading position during the forecast period, followed by Europe. In Asia Pacific, China and India are dominating the hair removal wax market, followed by Japan. Preference of the growing population for the waxing method of hair removal and innovation in hair removal wax products, such as introduction of natural ingredient-based wax, are significantly boosting demand for waxing among women. This, in turn, is fueling demand for hair removal wax in Asia Pacific. Some of the leading players of the hair removal wax market are American International Industries, Church & Dwight Co., Inc. (Nair), Coloris Cosmetics, FILO BIANCO S.r.l.,GiGi, Harley Wax, Jax Wax Australia, Karaver, Kera-Ban Wax Products, Lee-Chem Laboratories (Mandy’s), MarzenaBodyCare, Inc., Parissa Laboratories Inc., PerronRigot, Reckitt Benckiser (Veet), Sally Hansen, Starpil Wax Co., Sue Ismiel and Daughters (Nad's), The Darent Wax Company Ltd., and Xanitalia. The companies involved in this market are concentrating on research and development activities along with product innovation to strengthen their foothold in the market. Moreover, strategic partnerships and agreements with other companies is another key business strategy adopted by hair removal wax companies across different regions. For instance, in January 2018, Cirepil and Epillyss came together under Perron Rigot Company to offer both strip and non-strip waxes.